I was out doing a little window shopping today and had a chance to visit one of my favorite shops. It's called Tuesday Mornings. It's an eclectic shop of home items and my store recently added a little crafting section in one of the rows. I usually spend most of my visit in this area. On this occasion, I was surprised to actually find some fat quarter packs. The price was incredible. It was 12 fat quarters for either 6.99 or 7.99. 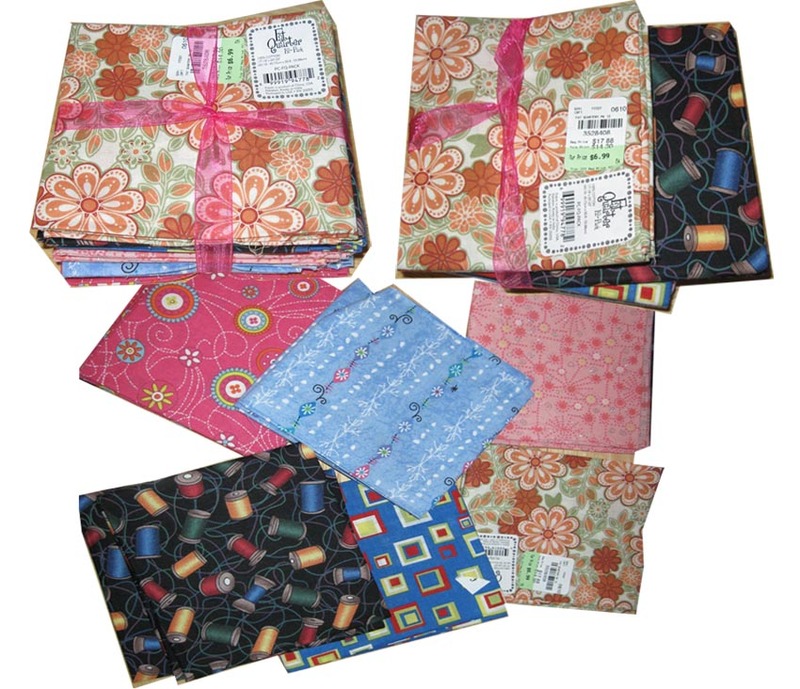 There were about 7 packs left of assorted fabric packs. I carefully reviewed them all and decided I needed to buy 1 pack. (I wanted to buy them all because of the price, but thankfully did not). There is only one pack in the photo to the right. It is just in different stages of photos. The one I picked had the cutest black fabric with thread spools on it. What's also nice is there were two of each fabric in the pack. So essentially, there were half yards of 6 types. I want to make an accessory hanger for around my sewing machine. Also in the pack I chose there were two different types of sparkly fabric. They are really cute. Time to scour the net for some fat quarter craft ideas or come up with some on my own!